*** ZONE Championship Entry ends at 23.59 on Wednesday 20th September 2017 *** SIs now posted. Run towards the end of the season in September; this is the most competitive regatta of the year and a must for sailors who are looking to gain places in Regional or National Squad. Laser Sailors who are aiming to be selected for National Squads should attend the UK events as detailed in the Squad Selection document! A fun and friendly event for less experienced sailors! Please be aware that whilst the event is being hosted by Fishguard Bay YC, the boat park will be the Parrog Car Park by Goodwick Beach which is close to the ferry port and the Event Centre is the Phoenix Centre. Camping is available on the rugby pitch next to the Phoenix Centre and Campervan parking, no electricity, will be on the free car park on the other side of the road from the Parrog car park. A map of the layout can be seen below. Online Entry is NOW OPEN please register by the 20th September. Pre-registering really helps us plan the logistics for the event. NB. Please have crew details to hand as they’re entered at the same time! Please print out if you want a copy as there will be very few in the Race Office. 1. Main Fleet (Optimist, Topper , RS Feva XL, Windsurfers and GH) – For sailors who are competent at sailing around a trapezoid course and can withstand a whole day out on the water. Welsh National and Regional Squad coaches will be on hand to offer any technical advice on the water. 2. 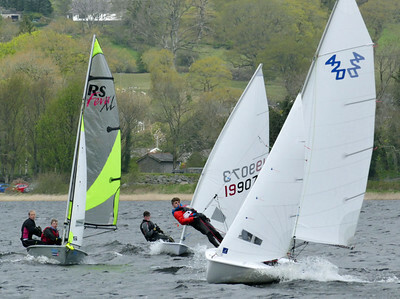 Regatta Fleet – For sailors who are new to racing or are young. Sailors will be able to go ashore for lunch on Saturday and Sunday and the racing is coached similar to the CYRC’s allowing sailors a little more help to get around the race course. Windsurfing – The windsurfers will be sailing with the Main fleet. The bay should provide some excellent conditions for windsurf racing. Zone Poster for your club. A great opportunity to young sailors who don’t already own their own boat and are sailing a club or centre boat to be gifted a brand new boat! Find out more here, please read all of the page and submit the Declaration of Eligibility. As with all of our event we heavily rely on volunteers to help us run the event. We have many roles that need to be manned from safety crew to registration assistance. If you would like to volunteer at this years Welsh Zone Championships please fill in the Volunteer Registration below. Please contact paul.simes@ryacymruwales.org.uk to advise what role you would like to volunteer for. Below is a volunteer role description sheet to give a brief summary of each role. Camping is available on the rugby pitch adjacent to the Phoenix Centre and Campervans are allowed to stay in the free car park between the boat park and the Phoenix Centre. Click here for more information on other accommodation and here for Tourist Information. It is planned to serve food from the Phoenix Centre kitchens and there is a local Tesco store next to the car park. There are also lots of places to eat in Fishguard.